Beauty salons can increase their clientele and manage the business of styling and cutting hair with this free, printable business plan. 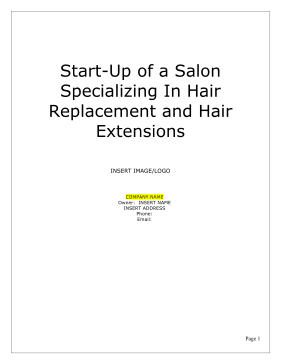 COMPANY NAME is seeking $127,000 funding in order to fund the start-up of a 'green' hair salon that focuses on hair replacement/hair extensions services targeting cancer patients and survivors in a high-end salon setting. The business will also offer traditional salon services and will offer some educational opportunities for stylists. The business will be located in [CITY], [STATE]. The business will be organized as a [STATE] LLC and will be owned 100% by INSERT NAME. INSERT NAME will be the full-time owner/operator of the salon. The salon focuses on hair replacement/hair extensions services targeting cancer patients and survivors in a high-end salon setting. In addition, the firm will offer laser hair growth services at $65 a session, estitician services, and retail sales of salon products. There are 1,530,000 new cases of cancer are expected to be found in the U.S. in 2010, of which 740,000 will be female. The 5-year relative survival rate for all cancers diagnosed between 1999-2005 is 68%, up from 50% in 1975-1977. There are currently 11,000,000 cancer survivors in the U.S., of which 5,320,261 are women. The high-end services and location of the salon in a high-income area will provide a stable demographic to support the business. All of this points to a large and growing market of potential customers of COMPANY NAME. COMPANY NAME is projecting $638,840 in annual sales and a $65,813 net profit in year 1, and is seeking $127,000 in funding to be used as follows. The working capital will be partially used to acquire inventory. 1. Hire employees; the firm will look to hire veterans, minorities, and the unemployed; as sales and cash flow improve.